Home Expert Advice Skincare Advice Paula's Choice Product Tips Which Strength of Retinol Do You Need? Topical retinoids are proven anti-aging powerhouses that can benefit nearly everyone’s skin. But retinol use comes with questions: What strength retinol should you use for wrinkles or other signs of aging? When and how should you use retinol products? Should you use a retinol cream or serum? What if your skin doesn’t respond well? As always, we’ve got the research-based answers for these questions, and more. How Much Retinol is Best? There’s not a one-size-fits-all answer, or a rule for how to tell what strength of retinol to use. Basically, it depends on your skin type, skin concerns, and your skin’s tolerance for vitamin A (another name for retinol). To determine your tolerance, experiment with different strengths and application methods, and see how your skin responds—beginning with a lower concentration. You don’t need a lot of retinol to see results: Published research has shown that concentrations as low as 0.01% retinol are effective for improving multiple signs of aging and minimizing pore size, along with improving skin’s healthy appearance. Low amounts of retinol, when paired with other antioxidants, also help defend the skin against environmental damage when worn under a broad-spectrum sunscreen during the day. SKIN BALANCING Super Antioxidant Concentrate Serum with Retinol—Silky, weightless, matte-finish serum best for combination to oily skin types. It contains several antioxidants (vitamins C and E, green tea, willow leaf, grape seed, and others) as well as 0.03% retinol. SKIN RECOVERY Super Antioxidant Concentrate Serum with Retinol—This moisturizing serum is loaded with skin-defending antioxidants, nourishing plant oils, calming ingredients, and 0.01% retinol. Excellent for normal to very dry or dehydrated skin. RESIST Barrier Repair Moisturizer with Retinol—This light, skin-softening nighttime moisturizer with a lotion texture combines 0.01% retinol with peptides, ceramides, and antioxidants, making it perfect for normal to dry skin or combination skin that’s on the drier side. Note: This formula is identical to our PC4MEN Nighttime Repair, packaged to complement the look of that line. RESIST Intensive Repair Cream with Retinol—A rich, emollient moisturizer for dry to very dry skin, it contains 0.01% retinol and a mix of multiple peptides, ceramides, niacinamide, and more. 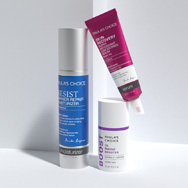 If you’re dealing with stubborn concerns like uneven skin tone, noticeable loss of firmness, deep wrinkles, and/or tenacious bumps and flaws, you may want to consider adding a higher-strength retinol product to your routine, either as a nightly step or 2–3 times per week, depending on your skin’s response. CLINICAL Ceramide-Enriched Firming Moisturizer—Formulated for all skin types, this creamy-smooth moisturizer features 0.1% retinol along with vitamin C and an infusion of concentrated ceramides to strengthen skin's protective barrier for a visibly plumped, supple, more youthful look. RESIST Intensive Wrinkle-Repair Retinol Serum—This supercharged serum combines 0.1% retinol with vitamins C and E plus soothing plant extracts. Consider alternating it with our RESIST Super Antioxidant Concentrate Serum, applying one in the morning, the other at night. RESIST Retinol Skin-Smoothing Body Treatment—A targeted body product that blends buttery emollients, antioxidants, and 0.1% retinol to create an unbelievably even skin tone and silky-soft skin while diminishing the look of flaws and bumps on the chest, neck, and arms. CLINICAL 1% Retinol Treatment—A powerhouse combination of 1% retinol plus vitamin C, peptides, antioxidants, and plant-based soothing agents, this sheer lotion formula tackles your toughest signs of aging and sun damage concerns. Suitable for all skin types, especially normal to dry. 1% Retinol Booster—This smooth fluid has a light-as-water feel and can provide the same amazing results as our CLINICAL 1% Retinol Treatment. Its texture makes it great for normal to oily or congested skin, but because it layers beautifully with any moisturizer or serum, it works well for all skin types. Note: When using moderate- to high-strength retinol products, pay attention to how your skin responds when used with your AHA or BHA exfoliant. If your skin shows signs of irritation, reduce the frequency of use until you find the right balance for your skin. If you’d like to read more about why retinol works so beautifully with AHAs, BHA, and vitamin C, check out our article, 5 Retinol Myths Busted!